Bacterial infections are still a major global healthcare problem. To combat the increasing antimicrobial resistance, early diagnosis of bacterial infections—including the identification of bacterial species—is needed to improve antibiotic stewardship and to help reduce the use of broad-spectrum antibiotics. To aid successful targeted antibiotic treatment, specific detection and localisation of infectious organisms is warranted. 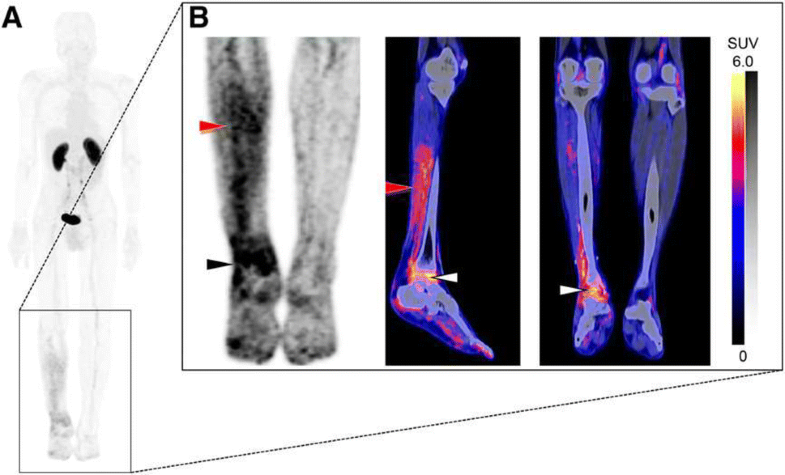 Nuclear medicine imaging approaches have been successfully used to diagnose bacterial infections and to differentiate between pathogen induced infections and sterile inflammatory processes. In this comprehensive review we present an overview of recent developments in radiolabelled bacterial imaging tracers. The PubMed/MEDLINE and Embase (OvidSP) literature databases were systematically searched for publications on SPECT and PET on specific imaging of bacterial using specific guidelines with MeSH-terms, truncations, and completion using cross-references. Tracers in literature that was extensively reviewed before 2016 were not included in this update. Where possible, the chemical structure of the radiolabelled compounds and clinical images were shown. In 219 original articles pre-clinical and clinical imaging of bacterial infection with new tracers were included. In our view, the highest translational potential lies with tracers that are specific to target the pathogens: e.g., 99mTc- and 68Ga-labelled UBI29–41, 99mTc-vancomycin, m-[18F]-fluoro-PABA, [methyl-11C]-D-methionine, [18F]-FDS, [18F]-maltohexaose and [18F]-maltotriose. An encouraging note is that some of these tracers have already been successfully evaluated in clinical settings. This review summarises updates in tracer development for specific (pre-clinical and clinical) imaging of bacterial infections. We propsed some promising tracers that are likely to become innovative standards in the clinical setting in the near feature. Despite the success of treating bacterial infections with antibiotics, e.g., penicillins, quinolones, and glycopeptides, bacterial infections still pose a serious global health threat. Of 2 million bacterial infections each year in the USA alone at least 23,000 results in death, making an estimated economic impact of $55–70 billion per year . Antibiotics are key to the success of treating bacterial infections, but to retain antibiotics effectiveness, the use of broad-spectrum antibiotics should be restricted, and the use of dedicated small-spectrum antibiotics promoted. Antibiotic stewardship can, however, be applied much more efficiently when fast and accurate diagnosis are made. For example, the ability to accurately differentiate between aseptic loosening of artificial joints and pathogen infection could help to drastically reduce the use of broad-spectrum antibiotics in the future . Characterization of the causative pathogen would be a second step needed to refine diagnosis. As the usability of the clinically available radiotracers is impaired by imaging of host inflammatory processes, further development of radiotracers that can image bacterial infections and discriminate them from sterile inflammatory processes and/or malignancies would benefit patients [3, 4]. Currently, microbiologic cultures or biomolecular techniques such as quantitative or broad range polymerase chain reaction (PCR) act as gold standard tools to diagnose causative pathogens . These techniques are limited by the availability of tissue samples  and may not be suitable to detect dormant organisms or those that are hard to culture . Radiological imaging techniques (CT, MRI, X-ray, and ultrasound) may aid in localising the infections , but these modalities are only able to visualise advanced diseases that have altered the patients natural tissue anatomy [9, 10]. 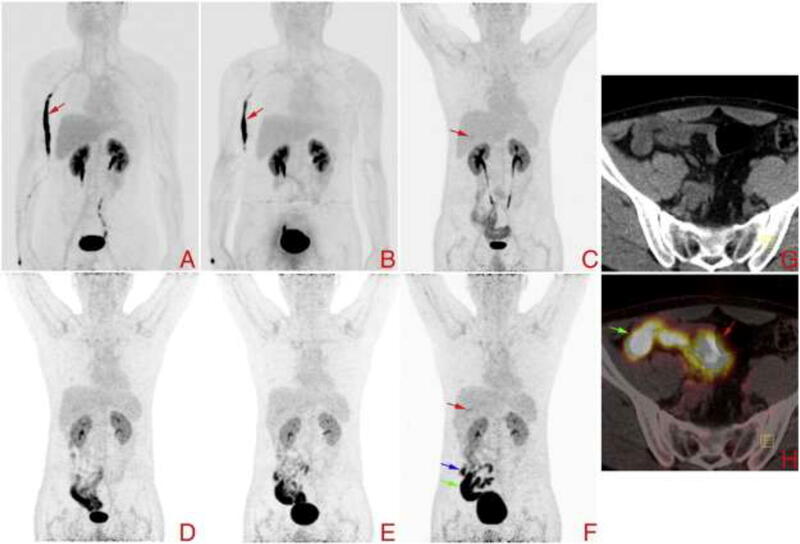 Molecular imaging solutions—as in oncology—have been shown to aid non-invasive diagnosis of bacterial infections in an early (non-disruptive) state . Examples of these techniques are summarised in Table 1 and includes radiotracers such as 67Ga-citrate, 99mTc-labelled autologous leukocytes and [18F]-FDG, which are commonly used in western clinical practise [9, 12, 13]. For the current review, the PubMed/MEDLINE and Embase (OvidSP) literature databases were systematically searched for publications on SPECT and PET on specific imaging of bacterial using specific guidelines with MeSH-terms, truncations, and completion using cross-references. Tracers from literature that were reviewed before 2016 were not included in this update. This review is an update of our earlier review published in 2013 , as well as other thematic reviews [12, 15, 16, 17, 18, 19, 20, 21]. 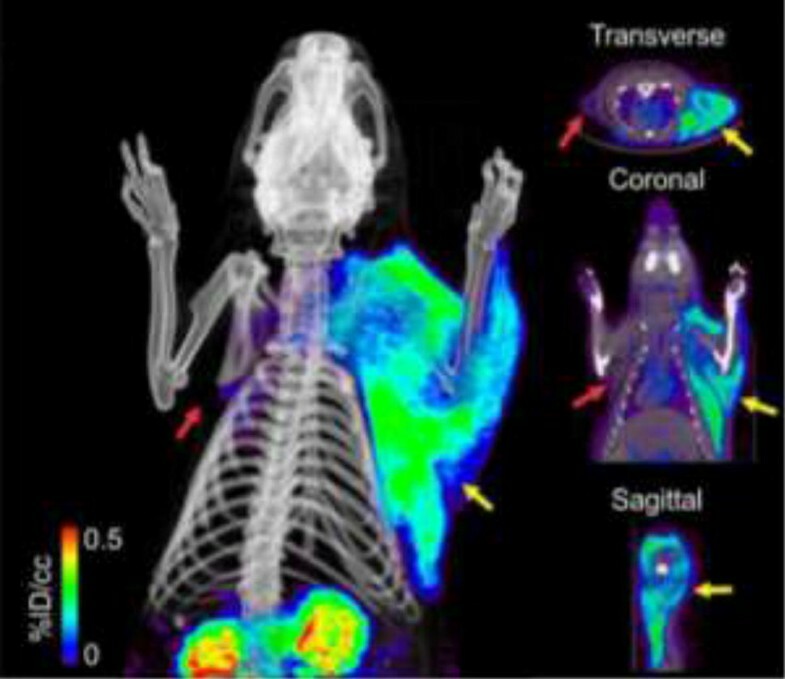 Hereby we specifically focus on the status of radioactive tracer development of SPECT and PET infection imaging, their selectivity for infections with bacteria, and the potential for clinical translation. In this chapter we describe infection-imaging tracers based on compounds that display antimicrobial activities. Often, such compounds show preferential binding of interaction with bacterial surfaces and structures. As early as 1988, 99mTc-, 125I- and 111In-radiolabelled monoclonal antibodies (mAbs; molecular weight ≈ 150 kD) directed against bacterial epitopes, including the biofilm-associated pili, the 0-side chain of Pseudomonas aeruginosa, and staphylococcal antigen A, have been evaluated as SPECT imaging agents in bacterial infection models [22, 23, 24, 25]. Although initial results were promising regarding to sensitivity (abscess-to-muscle ratios ranging between 5 and 12), the relatively large radiolabelled mAbs slowly cleared from the circulation resulting in high radiation burden and high background uptake in liver and other tissues. As a result, significant abscess-to-muscle ratios were only obtained 3 days post-injection. A mAb (1D9) directed against staphylococcal antigen A, Yersina adhesion A, or the Gram-positive bacterial surface molecule lipoteichoic acid was recently radiolabelled with either 64Cu or 89Zr (t1/2 = 12.7 h and 78.4 h respectively) and evaluated using PET imaging in mice [23, 24, 26]. 1D9 mAbs clearly targeted S. aureus at 3 days post-injection of the tracer with abscess-to-background ratios that were 2–3 times higher than in controls and comparable with ratios obtained with [18F]-FDG (Fig. 1A). However, 1D9 also yielded nonspecific uptake in infections with E. coli and in lipopolysaccharide-induced sterile inflamed tissues, which has been attributed to the mAb binding to Fc receptors omnipresent on the cell membrane of infiltrating macrophages [27, 28] (Fig. 1B). Antibiotics are designed to penetrate diseased tissue and are rapidly cleared from non-target tissues in contrast to large antibodies. When combined with short half-life isotopes (e.g., 99mTc and 18F) such small molecules could substantially increase diagnostic speed and accuracy . 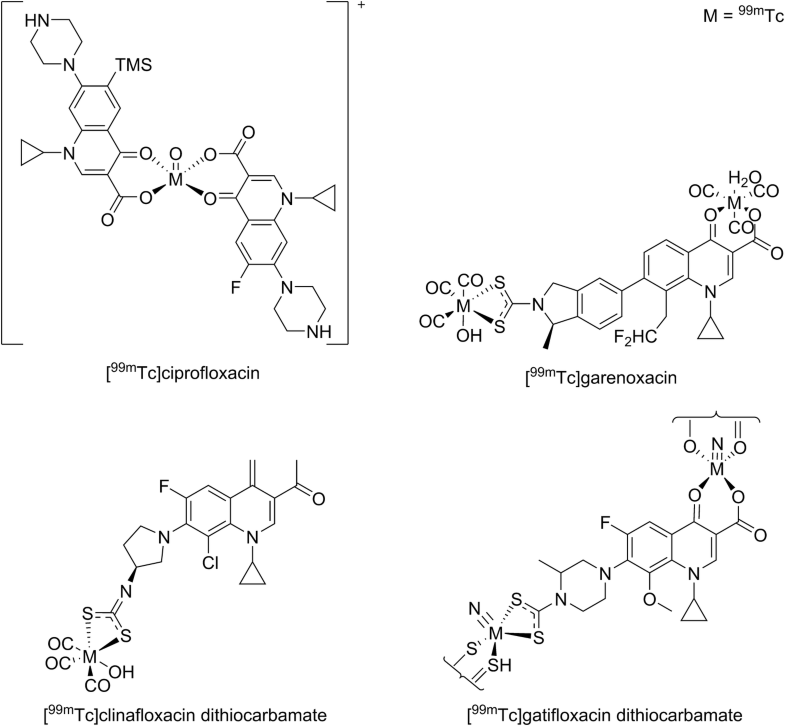 The fluoroquinolones are natural antibiotics and act as inhibitors of bacterial DNA synthesis. By binding to the enzyme–DNA complex, they block the DNA replication. The most studied natural antibiotic-based tracer is 99mTc-ciprofloxacin (Scheme 1), which was introduced in a clinical setting in 1997 . An extensive evaluation of 99mTc-ciprofloxacin was performed under the supervision of the International Atomic Energy Agency (IAEA) including more than 900 patients with a suspected bacterial infection [31, 32]. This study resulted in an overall sensitivity of 85% and a specificity of 82% which can be considered low for a bacteria-specific tracer. For example, combined radiolabelled 111In-leukocytes and 99mTc-MDP-SPECT of osteomyelitis, both non-specific tracers, already presented a sensitivity of 95% and a specificity of 93% . Possible explanations for these unsatisfactory results, which limits its widespread clinical applicability, include radiochemical impurities, nonspecific binding and high efflux from the site of infection [34, 35, 36, 37]. Shah et al. studied three additional radiolabelled antibiotics (Scheme 1) derived from last resort fluoroquinolones : 99mTc-labelled garenoxacin dithiocarbamate , 99mTc-clinafloxacin dithiocarbamate , and 99mTcN–gatifloxacin dithiocarbamate . In biodistribution studies in rats all these radiolabelled antibiotics demonstrated good uptake in multi-resistant S. aureus and penicillin-resistant streptococcal infections (abscess-to-muscle ratios between 4.4 and 6.5). Unfortunately, these findings were not supported by imaging data. 99mTc-labelled vancomycin and 99mTc-HYNIC-vancomycin (Scheme 2; coordination chemistry unknown) were also studied for their potential to image bacterial infections [42, 43]. 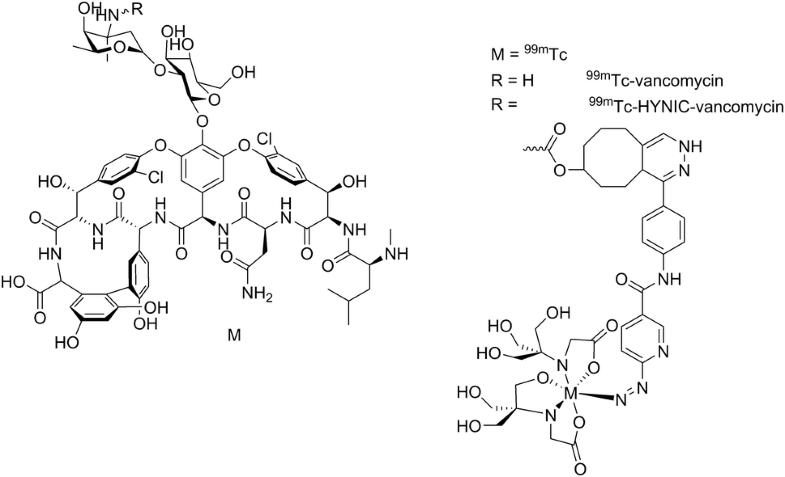 Vancomycin, to date the first line antibiotic treatment for methicillin-resistant S. aureus (MRSA), is a natural antibiotic that inhibits the bacterial cell wall synthesis of Gram-positive bacteria by binding to a peptidoglycan precursor and subsequent accumulation on the bacterial cell wall . 99mTc-vancomycin showed preferential binding to bacteria in vitro, and in vivo biodistribution and targeting studies in S. aureus-infected rats and mice revealed rapid clearance via liver, intestines, and kidneys with high tracer uptake (abscess-to-muscle ratio of about 5) in infected muscles. These results were later successfully repeated with fluorescently labelled vancomycin in mice and in an ex-vivo human tissue model of infection . The synthetic antibiotic trimethoprim (TMP) inhibits bacterial dihydrofolate reductase, an enzyme in the DNA synthesis and folate pathway of most bacterial species including Gram-positive, Gram-negative, mycobacterial species such as M. tuberculosis, and some parasites such as T. gondii. As a PET tracer, [18F]-fluoropropyl-trimethoprim ([18F]-FPTMP) (Scheme 3) showed high uptake in bacteria in vitro, and abscess-to-muscle ratios between 2 and 3 in mice. However, because of the high background activity in liver, gall bladder and intestines, imaging of abdominal infections is limited . Sites inoculated with less than 1 × 108 viable bacteria remained undetectable, which indicates a low sensitivity and could impair clinical imaging of low grade infections and monitoring the effect of antimicrobial therapy. Radiolabelled isoniazid is based on the antibiotic known as isonicotinylhydrazide that has been used for the treatment of tuberculosis. Isoniazid is catalytically coupled to NADH in bacteria by a peroxidase enzyme and subsequently inhibits mycobacterial cell wall synthesis. 99mTc-isoniazid, was evaluated for imaging of M. tuberculosis in rabbits. 99mTc-labelled isonicotinic acid hydrazide was taken up in M. tuberculosis bearing lesions in the leg (abscess-to-muscle ratios of about 2.5). Additionally, in 6 patients with known tuberculosis infections in the lungs 99mTc-isoniazid demonstrated moderate the tracer uptake [47, 48] (Fig. 2). Antimicrobial peptides (AMPs) were designed to rapidly kill a broad spectrum of pathogens, including Gram-positive and Gram-negative bacteria, fungi, parasites, and even enveloped viruses . In low quantities, however, radiolabelled cationic AMPs have been successfully used for bacterial imaging. Cationic AMPs bind to negatively charged lipoteichoic acid, phospholipids, and lipopolysaccharides on bacterial membranes [50, 51]. The most widely investigated AMP for SPECT imaging of bacterial infections in mice, rats, and rabbits [52, 53, 54], 99mTc-UBI29–41, is a cationic synthetic fragment (TGRAKRRMQYNRR) derived of the natural cationic AMP ubiquicidin (UBI1–59) . From preclinical studies in vivo it has been shown that 99mTc-UBI29–41 (coordination unknown) and 99mTc-HYNIC UBI29–41 (Scheme 4) accumulated specifically in infected tissues with abscess-to-muscle ratios between 2 and 3 [14, 56, 57]. Both recently developed PET analogues 68Ga-NOTA-UBI29–41 [12, 58, 59, 60, 61] and 68Ga-NOTA-UBI31–38  showed comparable uptake characteristics in infected thigh muscles in mice and rabbits. However, UBI29–41 also accumulated in infections with the yeast C. albicans , which reduces specificity of this tracer for imaging of bacterial infections alone. It is encouraging to notice that 99mTc- and 68Ga-UBI29–41 accumulated in bacterial infected tissues in patients (Figs. 3, 4). A pooled meta-analysis of clinical studies with 99mTc-UBI29–41 showed 95% sensitivity, 93% specificity and 94% accuracy in various clinical settings including prosthetic infections, diabetic foot infections, fever of unknown origin, osteomyelitis, mediastinitis, and appendicitis [55, 64, 65]. Due to its ability to discriminate between infection and sterile inflammation, general safety, the lack of side effects [66, 67, 68, 69], and the successful transformation to kit formulations [59, 70, 71, 72], radiolabelled UBI29–41 has been proposed as a good candidate for applications in routine imaging [4, 9, 61]. Nevertheless, prospective multi- centre studies of both 99mTc- and 68Ga-UBI29–41 should still be carried out to achieve robust evidence of the accuracy in clinical imaging of bacterial infections. Additionally, the introduction of the hybrid tracer 111In-DTPA-Cy5-UBI29–41 allowed radioactive and fluorescence imaging of bacterial infections using SPECT and optical imaging modalities . 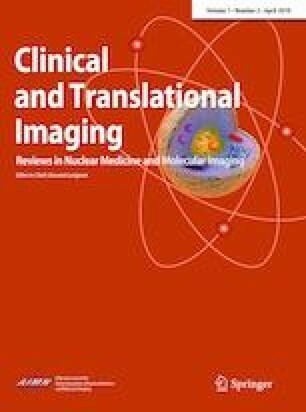 The hybrid imaging approach for imaging of deep infections it is postulated, when combined with a radioisotope, sites of infection can be identified using non-invasive nuclear imaging techniques and guide the subsequent surgical intervention and fluorescence guided surgery [74, 75]. Research with other AMPs for pre-clinical imaging of infections is still ongoing [52, 76, 77, 78, 79]. Recently, a synthetic analogue of the natural cyclic antimicrobial peptide depsidomycin (68Ga-DOTA-TBIA101, Scheme 5), was investigated for its characteristic to target bacteria. 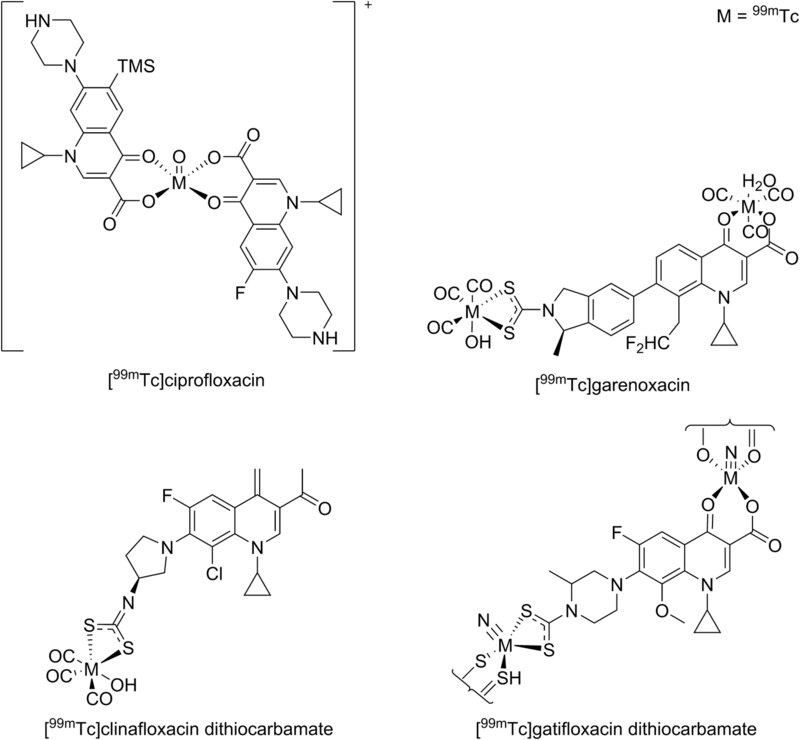 Depsidomycin itself is a natural AMP isolated from S. lavendofolae and exhibits antimicrobial activities against i.e., drug-resistant M. tuberculosis . As a tracer, 68Ga-DOTA-TBIA101 detected muscular E. coli infections in mice with abscess-to-muscle ratios between 1.2 and 1.6 , S. aureus (with a target-to-nontarget ratio between 1.2 and 1.3), and M. tuberculosis (abscess-to-muscle ratios between 2.0 and 2.8) infections in rabbits . These results indicate a preference for infections with M. tuberculosis, but unfortunately the tracer also accumulated at sites of sterile inflammation which limits its translational potential. Bacteriophages belong to a class of viruses that are able to bind to specific surface receptors on selective bacteria because they use bacteria as host for their replication . Thus, bacteriophages as radiotracers have potential for imaging specific strains of bacteria. Already in the first decades of the last century bacteriophages were considered an asset in the treatment of bacterial infections . The earliest study with radiolabelled bacteriophages as a tracer for bacteria was performed by Rusckowski et al.. During their study, they conjugated the bacteriophage M13 with mercaptoacetyltriglycine (MAG3) to enable facile labelling with 99mTc (99mTc-MAG3-M13) for imaging infections with three different bacterial species, including two E. coli species and S. aureus in mice. Uptake in bacterially-infected tissues was higher (abscess-to-muscle ratio of 2.3) than in sterile inflammations or normal tissue. These results, as they were promising, were downplayed due to poor image quality as shown in Fig. 5 for S. aureus. Interestingly, the intensity of tracer uptake waned over time as a result the antimicrobial effect that the phages had on the bacteria. Furthermore, high uptake in thyroid glands, was observed indicating release of 99mTc and clearance of the phage was indicated by uptake in the liver and kidneys [85, 86]. In a second attempt, four different bacteriophages (phages P22, E79, VD-13, and phage 60) were radiolabelled with 99mTc using the chelator MAG3 . Biodistribution studies were performed for different bacterial species (P. aeruginosa, E. coli, S. enterica, and K. pneumoniae). Of the studied agents, only bacteriophage 99mTc-MAG3-E79 showed specificity for P. aeruginosa. (abscess-to-muscle ratios between 10 and 28; a fourfold increase compared to other bacteria). The other radiolabelled phages accumulated in infected thigh muscles with abscess-to-muscle ratios between 2 and 5 suggesting nonspecific uptake. Uptake of radiolabelled phages in the liver (13.1%ID/g) and intestines (11.1%ID/g) was high (Fig. 5). More recently, Cardoso et al. evaluated in a biodistribution study the 99mTc-labelled bacteriophage PP7 for detecting P. aeruginosa infections in mice and this tracer had an increased accumulation in P. aeruginosa-infected tissues (abscess-to-muscle ratio 4.2 ± 0.3) compared to sterile inflammations (abscess-to-muscle ratio 2.5 ± 0.4). 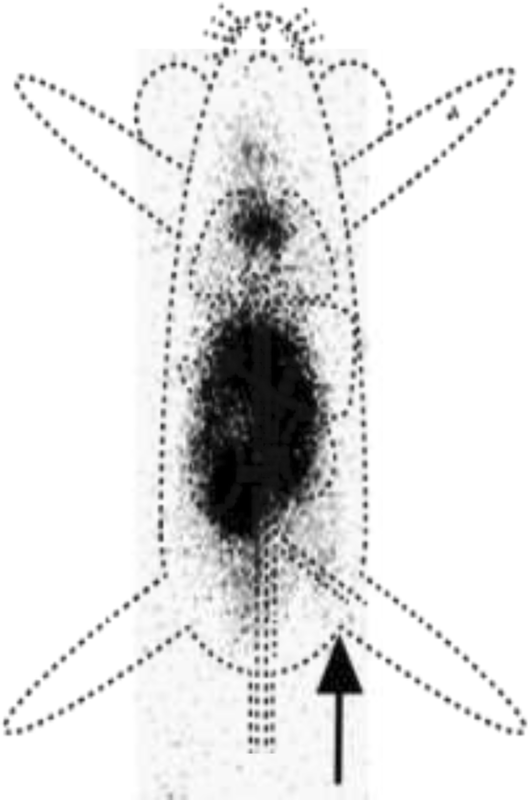 Radiolabelled bacteriophages, whereof some show specific binding to bacteria as was demonstrated in the imaging studies. Unbound phages rapidly accumulated in the liver and intestines. Due to the poor imaging quality the translational properties of radiolabelled phages for imaging of bacterial infections is limited. Efforts have been made to develop tracers based on molecules that participate in metabolic processes that are either unique to bacterial/prokaryotes or more dominantly present in bacteria. These include molecules that are used as an energy source, building block for cell wall synthesis or are metabolic substrates for DNA synthesis, proliferation and virulence. Certain metabolic enzymes are expressed only in bacteria or even in specific strains of bacteria and as such these processes are ideal targets for specific imaging of bacteria and this is a different approach than with tracers based on antimicrobial activities. 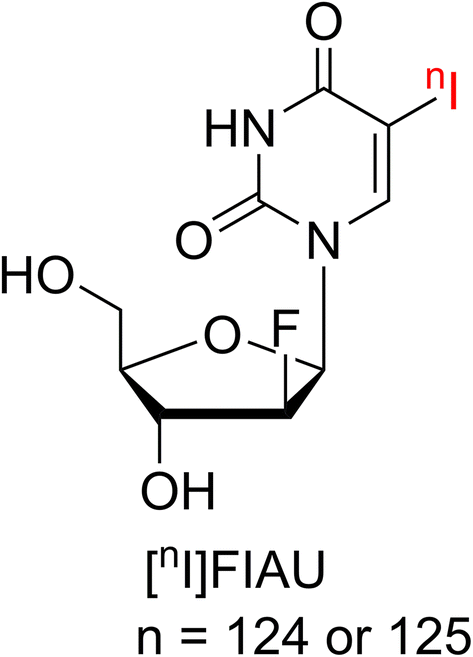 The SPECT tracer [125I]-FIAU or PET tracer [124I]-FIAU (Scheme 6) is based on a nucleoside substrate for thymidine kinase. These tracers have been investigated for the imaging of infections in mice with E. coli, S. aureus and other bacterial strains [88, 89]. Image quality depended on the type of pathogen and host metabolism activities. For example, mitochondrial thymidine kinase in cancerous malignancies reduced the specificity [90, 91]. Promising results were obtained with imaging [124I]-FIAU in patients (n = 8) with proven musculoskeletal infection (Fig. 6) . Unfortunately, a more recent multi-centre study reported low specificity and poor imaging quality in patients (n = 34) with suspected prosthetic joint infection , which limited further exploitation of [124I]-FIAU. A radiofluorinated analogue of p-aminobenzoic acid (m-[18F]-fluoro-PABA) (Scheme 7), which is a substrate for folic acid synthesis in prokaryotes , was evaluated in rats infected with methicillin‐resistant or -sensitive S. aureus . Bacteria use folic acid for their synthesis of nucleic acids. 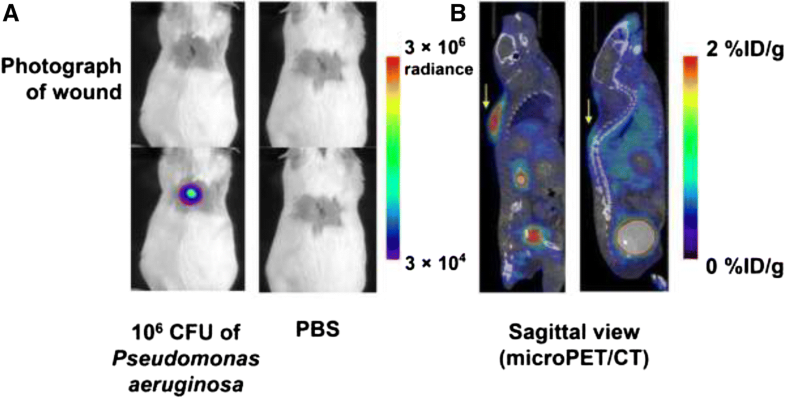 In this rat model, PET imaging with m-[18F]-fluoro-PABA imaging revealed rapid uptake in bacterial infections (abscess-to muscle ratio ≈ 8) (Fig. 7) and because the uptake in sterile inflammatory sites was about nine–fold lower, m-[18F]-fluoro-PABA can be considered specific for the imaging of bacterial infections. Interestingly, m-[18F]-fluoro-PABA showed reduced uptake in oxacillin treated S. aureus tissues, which indicates that this tracer can be applied in response monitoring applications. As 2-[18F]-fluoro-PABA poorly interacts with mammalian cells, this tracer holds potential for clinical translation. Another substrate related to the folate synthesis pathway, methionine, is a metabolite essential for methylation pathways. This compound, which has been studied in the context of imaging S. aureus and E. coli infections, is an essential amino acid and is readily incorporated into E. coli muropeptides and plays an important role in cell signalling. Based on the uptake of [methyl-11C]-D-methionine muscle infections in mice with viable E. coli and S. aureus could be differentiated (with 6–9 times higher abscess-to-inflammation ratios) from sites injected with heat-killed bacteria (Scheme 7) . However, before considering clinical imaging of infections, additional imaging experiments at later intervals are warranted to study the concomitant high tracer uptake in non-infected tissues including liver (15%/ID) and intestines (7%/ID), the latter of which, according to the authors, may be related to the presence of non-pathogenic bacteria in the microbiome . 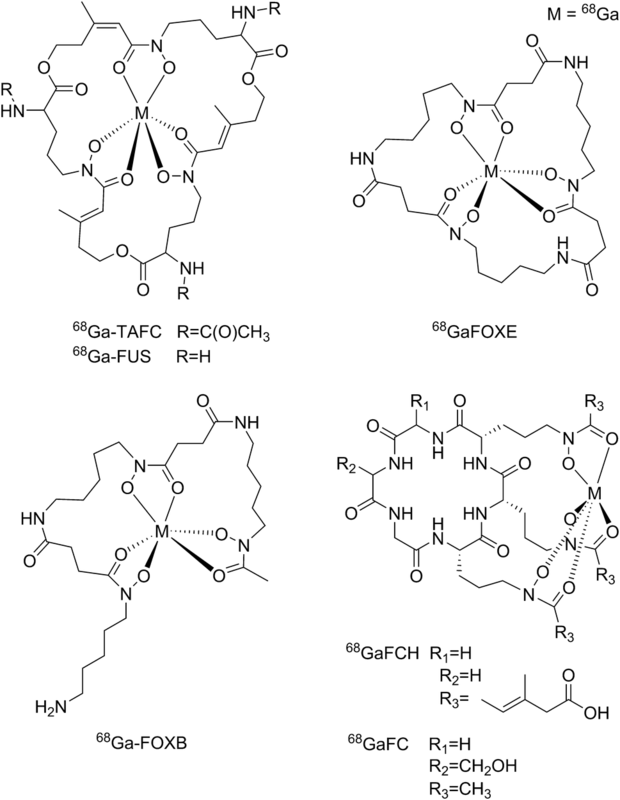 Siderophores, metal-chelating peptides,  are another example of prokaryote-specific tracers. These low-molecular-mass iron transporters are used by most bacteria, fungi, and some plants to scavenge iron from their environment which is critical because of a wide variety of metabolic processes. 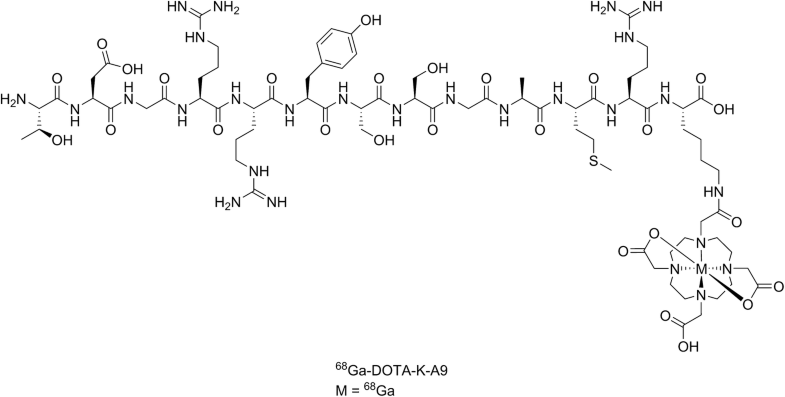 The peptides have the ability to coordinate In3+ and Ga3+ ions, as 111In- or 67Ga-labelled siderophores and these tracers are known to be taken up by bacteria and fungi [98, 99, 100]. When using 68Ga, the siderophores support PET imaging (Scheme 8). A proof-of-principle in vivo study was performed with the fungus A. fumigatus, the bacterium S. aureus and a sterile inflammation in a lung and thigh muscle infection model in rats with 68Ga-labelled triacetylfusarinine (68Ga-TAFC) . The tracer uptake was prominent in infected sites with A. fumigatus (abscess-to-background ratios between 5.8 and 6.6), but also some uptake in sterile inflammation sites was visible (albeit lower than for A. fumigatus but clearly visible; no inflammation-to-background ratios were given). No uptake was noticed in tissues infected with S. aureus which limits the clinical use of radiolabelled siderophores for imaging of bacterial infections. In bacterial infection, the responding endogenous inflammatory cells increase glycolysis as a source of energy. This increase makes the clinically approved PET tracer 2-Deoxy-2-[18F]-fluoro-d-glucose ([18F]-FDG) the most widely used radiotracer for non-invasive imaging of infections. Because uptake of glucose can also be related to other phenomena [4, 102, 103], there is a demand for alternatives with a higher specificity and sensitivity for bacterial infections. In 2008, Li et al. reported the reduction of [18F]-FDG using NaBH4 resulting in 2-deoxy-2-[18F]-fluoro-sorbitol ([18F]-FDS) (Scheme 9), an analogue of sorbitol . Because sorbitol is a substrate that is only metabolised by Enterobacteriaceae, a metabolic pathway that does not exist in mammalian cells [104, 105], it was reasoned that [18F]-FDS could also be a promising probe capable of distinguishing infections with E. coli  or K. pneumoniae  from infections with Gram-positive bacteria as well as from sterile inflammations. Indeed, E. coli infections could be properly visualised with [18F]-FDS in mice and the uptake in infected tissues increased about eight-fold compared to sterile inflammatory sites. Additionally, imaging of E. coli infections with [18F]-FDS was performed and, after antimicrobial treatment with ceftriaxone, infected tissues decreased eight-fold tracer uptake. This is a strong indication that [18F]-FDS can be employed for monitoring the effect of antimicrobial interventions [107, 108]. Following these promising initial findings, first biodistribution studies in healthy volunteers (n = 6) (Fig. 8) were undertaken, showing rapid renal clearance and the uptake of radioactivity in the colon and small intestines at later intervals . With these promising results imaging studies of infections in patients are eagerly awaited [104, 109]. Alternatively, radiolabelled di- and polysaccharides such as maltose and maltodextrin, are an obvious imaging vehicle as they are specifically incorporated into multiple Gram-negative and Gram-positive bacterial membranes but not in mammalian cells [110, 111]. The application of a 99mTc-labelled hydroxypropyl-B-cyclodextrin (99mTc-HPβCD) polysaccharide derivative (Scheme 10) as an infection-specific tracer was demonstrated by Shukla et al., where 99mTc-HPβCD was mainly cleared via the kidneys and showed increased uptake in an infected knee after injection in one patient (Fig. 9). More recently, Gowrishankar et al. and Ning et al. demonstrated the use of the PET tracers 6-[18F]-fluoromaltose (Fig. 10) and 6-[18F]-fluoromaltohexaose (Scheme 10) in identifying infections with E. coli in mice with high sensitivity and specificity . This tracer could discriminate between infectious sites with viable and dead bacteria. 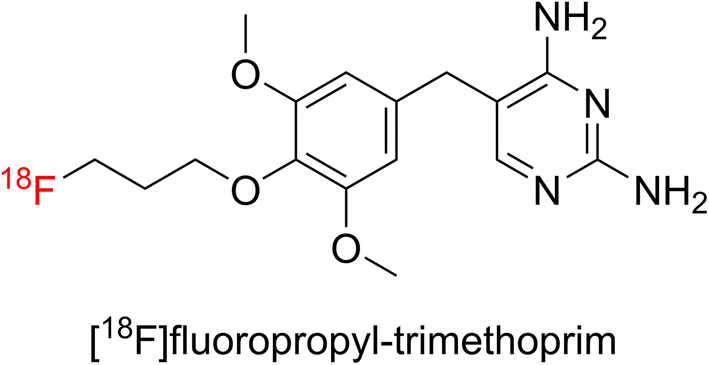 Similar results were reported for 6-[18F]-fluoromaltose and 6″-[18F]-fluoromaltotriose (Scheme 10, Fig. 11) both in mice and rats [114, 115]. However, it has been reported that starch-reducing enzymes present in the blood reduced the serum stability of the tracers which in turn would limit its clinical use . The synthesis of macromolecular peptidoglycan, a cell wall component that is present in both Gram-positive and Gram-negative bacteria, is another target for the specific imaging of bacterial infections. A single-stranded oligonucleotide , able to bind peptidoglycans with high specificity and sensitivity , was labelled with different radioisotopes and as such can be used for imaging bacterial and fungal infections [119, 120]. 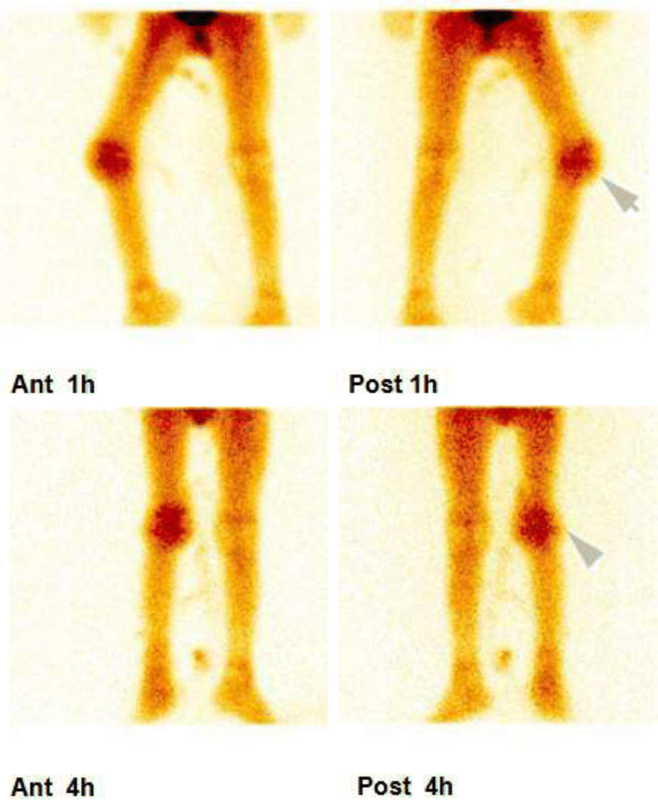 Imaging studies with the 99mTc-aptamer were carried out in thigh muscles of mice either infected with S. aureus, C. albicans, or with a sterile inflammation. Uptake in bacterial infections was low (abscess-to-muscle ratio ≈ 4) but with higher ratios compared to the uptake in infections with C. albicans (abscess-to-muscle ratio ≈ 2.0) or sterile inflammation (abscess-to-muscle ratio ≈ 1.2) thus allowing discrimination of bacterial infections from fungal infections. Although these results are promising for future clinical use of this tracer the rapid degradation of the 99mTc-aptamer in blood poses a limiting factor . Bacterial membranes and cell wall are different of structure compared to eukaryotic cells. In this chapter we describe the performance of tracers that specifically interact with specific bacterial structures. As cationic antimicrobial peptides interact with bacterial membranes as well, they were included in "Antibacterial tracers" because of their antimicrobial potential. Phage display library screening studies revealed a peptide [68Ga]‐DOTA‐K‐A9 with potency to bind to S. aureus-generated biofilms . After radiolabelling in vitro experiments revealed binding of [68Ga]‐DOTA‐K‐A9 to staphylococcal bacteria, S. dysgalactiae and P. aeruginosa, . In vivo studies in mice with the PET tracer [68Ga]‐DOTA‐K‐A9 (Scheme 11) confirmed accumulation in subcutaneous staphylococcal infections (abscess-to-background ratio ≈ 2.5) but also showed uptake at sterile inflammatory sites (inflammation-to-background ratio ≈ 2.4). According to the authors, this observation was caused by a combination of local hyperaemia and vascular leakiness . With the low specificity of [68Ga]‐DOTA‐K‐A9 for S. aureus and the accumulation in sterile inflammatory sites, the clinical use for imaging of bacterial infections is limited. The positively charged zinc-dipicolylamine (ZnDPA) moiety interacts with bacteria solely by electrostatic interactions and shows a selective affinity for the anionic cell membrane phospholipid phosphatidylserine. Various derivatives of 111In-ZnDPA (Scheme 12) have been developed [123, 124] and ZnDPA tracers accumulated specifically at sites of bacterial infections . In a thigh muscle model in mice infected with S. pyogenes111In-DOTA-biotin/SA/biotin-ZnDPA accumulated 2.eightfold higher in sites with infections than in sterile inflammatory sites. 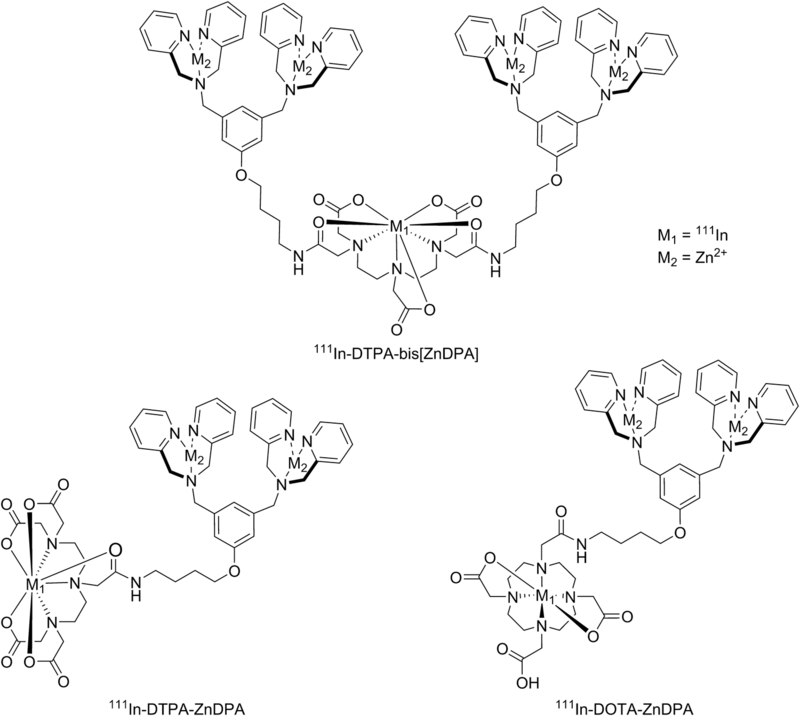 For ZnDPA-[111In]-DTPA and ZnDPA-[111In]-DOTA, each with a single ZnDPA targeting unit, and a divalent tracer, Bis(ZnDPA)-[111In]-DTPA abscess-to-muscle ratios between 2.4 and 6.2 for the divalent one was reported in S. pyogenes infected thigh muscles. Clearance of the divalent tracer from the bloodstream was, compared to monovalent tracers, slow and mainly through the liver, gall bladder and intestines. Because of exposure of negatively charged molecules however, in other studies 99mTc-HYNIC-DPA was shown to image cell death in vivo , cardiomyocyte apoptosis , mammary and prostate tumours , and more recently Leishmania major parasites . Because of the electrostatic interaction with charged groups within tumour cell membranes and necrotic tissues limits its use for specific imaging of infections . Newly developed pre-clinical SPECT and PET tracers, are showing promising results in distinguishing between sterile inflammation, bacterially induced infections, or cancer. Some of these tracers deliver, fast and accurate diagnosis of bacterial infections which is fundamental to initialise specific and efficient antimicrobial treatment and as such combat antimicrobial resistance. An overview of the proposed properties for these molecular imaging agents that can specifically target bacteria are shown in Table 2. Therefore, many efforts have been made in recent years to discover and develop novel radioactive bacteria-specific tracers as we discussed in this review, of which the most promising are depicted in Table 3. A limitation in reviewing tracer development for imaging infections is the great diversity in radiochemistry, animal models, the pathogens used, and the size of the inoculum. These factors limit the ability to draw conclusions or to make a direct comparison about performance in imaging of bacterial infections between the various tracers. In our view, the highest translational potential lies with tracers that are specific to target the pathogens: e.g., 99mTc- and 68Ga-labelled UBI29–41, 99mTc-vancomycin, m-[18F]-fluoro-PABA, [methyl-11C]-D-methionine, [18F]-FDS, [18F]-maltohexaose and [18F]-maltotriose. An encouraging note is that some of these tracers have already been successfully evaluated and compared with commonly used tracers in clinical settings . Altogether, pre-clinical development and evaluation of radioactive labelled bacteria-imaging tracers for SPECT/PET imaging is still in progress and shows improvements in specificity and sensitivity. As we described in this review, for radiolabelled bacteria imaging tracers the issue of differentiating infections from other pathologies remains the biggest hurdle to take. Fortunately, the first results show great promise and some of these tracers are recently evaluated in clinical studies. Data concerning specificity, sensitivity, and safety assessments including toxicity and dosimetric issues are eagerly awaited. Despite the enormous progress in the development of bacteria-specific radiotracers, it must be kept in mind that none of the previously described tracers is able to discriminate between antibiotic sensitive or -resistant bacterial strains. Therefore, more research is required to bridge the gap between imaging and molecular techniques for detection of different bacterial species and the resistance properties, especially for bacteria in chronic or recurrent infections. This approach may have the greatest potential to increase the contribution of clinical diagnostics to personalised antimicrobial therapy in the near future. In relation to infection imaging in less developed countries there is an urgent need for specific imaging at low-costs. As nearly 2/3 of the world’s population does not have access to any radiological services, with the development of low-tech handheld imaging modalities and specific bacterial infection imaging tracers, may effectively assist diagnosing infections the field. Widespread use of smartphones and tablets throughout developing countries promotes to use in combination with wireless and portables technologies [130, 131, 132]. This, as a result of misdiagnosis of infections and other tropical diseases, to limit the overuse of antibiotics which leads to increasing rates of drug resistance . 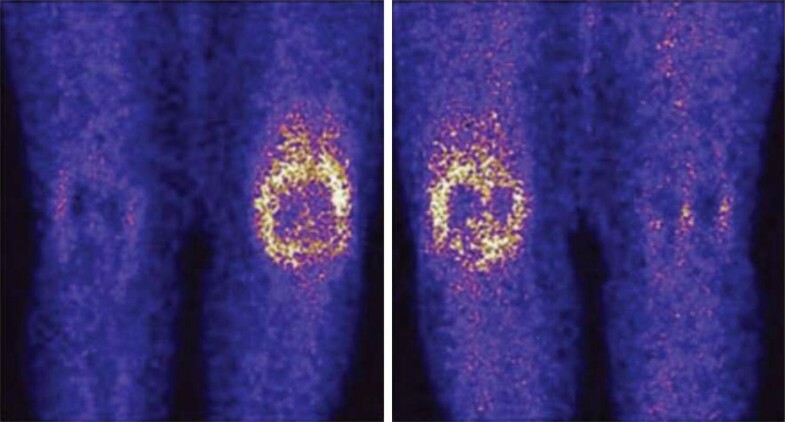 In the last decade, fluorescently labelled imaging agents have attracted enormous attention  and more recently hybrid tracers which include both a radioactive and optical reporter molecule were introduced . Applying both techniques for dedicated infection imaging may be an advantage as bacteria can be localised and quantified by nuclear imaging modalities such as SPECT and PET, and areas may be cleaned based on optical real-life fluorescence imaging. Hybrid tracers such based on UBI29–41 are specifically designed to facilitate such transitions . The research leading to these results was funded with grants from the Netherlands Organization for Scientific Research (VIDI-grant - STW BGT11272), Meta Roestenberg was supported by a VENI grant from ZONMW and a Gisela Thier fellowship from the LUMC. In the selected literature those were only included if all procedures followed were in accordance with the ethical standards of the responsible committee on human experimentation (institutional and national) and with the Helsinki Declaration of 1975, as revised in 2008.